Shock is a life-threatening medical condition that is essentially a decrease in blood flow to the brain and other important organs. Shock can arise in several situations, including due to uncontrolled bleeding from a traumatic injury. This is known as hypovolemic shock. Because blood carries oxygen with it, this can result in a destructive lack of oxygen to the tissues. It can also lead to cardiac arrest. Untreated, shock from bleeding will almost always cause death. The most important step in treating this form of shock is to control bleeding. However, if the victim is already showing signs of shock, it's important to take the necessary steps to stabilize the victim until help arrives. As with all emergency treatment, make sure you remain safe. Follow universal precautions and wear personal protective equipment if you have it. With shock due to bleeding, you want to limit your exposure to blood. You may also be in a situation such as at a car crash scene where you may be in danger from debris, fire, or being struck by traffic. You cannot be helpful to a victim if you allow yourself to be injured in the process. Call for an ambulance. Remember that 911 works differently on a wireless phone than it does from the home or office. You need to ensure that the responders know where you are so they can reach the victim as quickly as possible. Make sure the victim is breathing. If not, begin rescue breathing. Before any other treatments for shock are done, bleeding must be stopped. 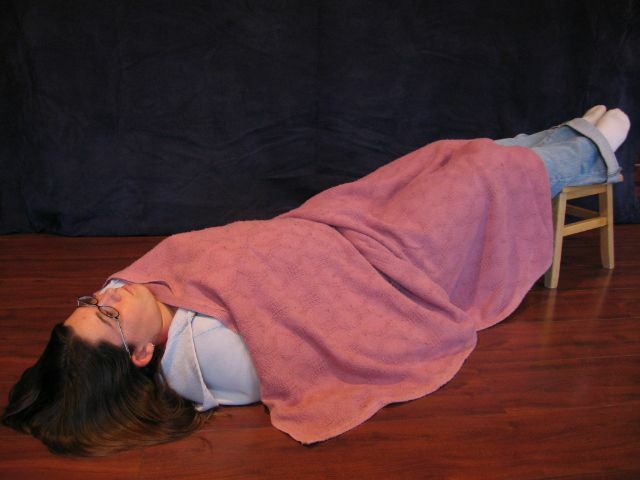 If you do not suspect a neck injury, lay the victim on his or her back (supine) and elevate the legs about 12 inches. This will help increase the circulation to the heart, brain, and major organs. If you suspect a neck injury, do not move the victim or change his position. Car and other vehicle accidents often lead to neck injuries. Neck injuries are also common in falls, especially falls from a height taller than the victim. Keep the victim warm so he doesn't develop hypothermia. With decreased blood flow, he will chill faster. Continue to check on the victim. If the victim stops breathing, begin rescue breathing. If the victim vomits, roll the victim to one side and sweep the vomit from his or her mouth with your fingers. Do not give the victim any fluids by mouth as this may simply result in vomiting. The person in hypovolemic shock often is thirsty, but you must not give him fluids by mouth. Await the arrival of emergency personnel. If the person needs to be moved for safety or to evacuate him to where emergency personnel can be reached, try to carry him as flat as possible with his head down and feet lifted. If you suspect a neck injury but must move the person, stabilize the head and neck before moving. Shock—The Domino Effect. American Red Cross.